June 2002. The end of the second series of Paul McGann audios. For the first six months of the year, the eighth Doctor plays have taken over Big Finish’s main range in the audios’ most ambitious ‘arc’ yet. In response, the comic strip has deployed the Daleks, in the highly-acclaimed Children of the Revolution, and BBC Books’ Eighth Doctor Adventures have embarked on their own ‘arc’ focusing on the vulnerability of time in the wake of the Time War, with a mysterious villain called Sabbath bedevilling the Doctor, Fitz and Anji. But the Big Finish main range is where it’s at. The halcyon days for Big Finish really lasted from mid-2000 – when McGann’s return was announced and the novels thoroughly trashed their own continuity in a fit of self-loathing, hovering anxiously waiting for the audios’ next move – to 26 September 2003, when it was announced Doctor Who would be returning to TV. 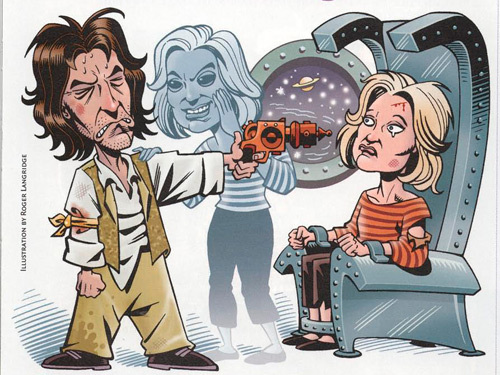 By the time Neverland’s belated (and lukewarmly received) follow-up Zagreus was released in November 2003 in time for the fortieth anniversary, events had already overtaken the eighth Doctor plays, and McGann’s incarnation was a dead man walking. So this moment marks perhaps Big Finish’s high watermark. That’s reflected in the writing credits for McGann’s second year: three of the authors (Mark Gatiss, Robert Shearman and Paul Cornell) went on to provide scripts for the 2005 TV series, and three (Nicholas Briggs, Justin Richards and Alan Barnes) were the head writers or editors of the audios, BBC Books and DWM comic strip respectively. In other words, this was a series written by the ‘Wilderness Years’’ most experienced hands. In many ways, it’s the culmination of 13 years of non-TV Doctor Who, the Abbey Road of the ‘Wilderness Years’, a definitive statement of what fans could achieve without a new series. If you can get to Neverland without a TV show, imagine where you could go with one. It’s also the culmination to a two-year storyline. Storm Warning introduced the idea that Charley Pollard had cheated death in escaping from the doomed airship R101. But, as in Final Destination, death can’t be so easily avoided. There’s a price to pay for eighth Doctor’s casual attitude towards it, evident since his resurrection of Grace and Chang Lee in the TV movie. That price is explored across the six 2002 audios, where it becomes clear that Charley’s continued existence when she should be dead is fracturing the web of time. Across the series, the stakes have gradually risen from the claustrophobic horror of The Chimes of Midnight, which explored the impact of Charley’s death/survival on those she left behind, to The Time of the Daleks, which featured history breaking down. Neverland is the pay-off: the Time Lords (still alive in Big Finish’s continuity) are now alerted to the danger Charley poses, and have hunted down the TARDIS to bring her paradoxical existence to an end. Neverland also follows through on the development of the eighth Doctor’s character. The TV movie casts McGann as a fairly straightforward romantic hero – charming Grace, enthusing about shoes and revealing outrageous secrets. However, it also posits the Doctor and Grace as a kind of screwball comedy double act, a partnership of equals with Grace disrupting his world as much as he does hers. This idea of a partnership was followed through by the audios, with strong female characters – Charley, Lucie and Molly – that drop into the Doctor’s world and disrupt it. CHARLEY: It’s all right, Doctor. I’m not afraid. It’s like I said in the Tardis. My time is up. There is no alternative. Oh, Doctor, you rescued me from the R101. You gave me these last few wonderful months. The things that I’ve seen, the places I’ve been. I’ve lived more than I ever could dream of, and all thanks to you. And you’re the sweetest, the kindest, most wonderful man I’ve ever met. And I’m sorry it’s come to this, and I’m sorry it has to end like this, but if the Web of Time is destroyed then all the time I’ve had, everywhere I’ve been, all those fabulous, fantastic things we’ve done, they won’t ever have happened at all. Don’t let those times be taken away. Don’t let it all go to waste. I know it’s an awful, terrible thing, but I want you to do it. Oh, Doctor, please do it before it’s too late. DOCTOR: Charley, I can’t. You’re my friend, and I love you. I can’t look you in the eye and shoot you no matter what. CHARLEY: Doctor, I love you too, and this is no way to say goodbye, but please, please! Oh, what’s wrong with you! You’ve saved the universe before, so do it again, the only way how. RIVER: If you die here, it’ll mean I’ve never met you. DOCTOR: Time can be rewritten. RIVER: Not those times. Not one line. Don’t you dare. It’s okay. It’s okay. It’s not over for you. You’ll see me again. You’ve got all of that to come. You and me, time and space. You watch us run. This is the moment the ‘Wilderness Years’ have been leading to: a Doctor who openly admits to loving his companion; a series where the epic and the personal are all the same. This is Doctor Who with the emotional tug of a good soap opera and the scale of a Hollywood blockbuster. It’s Doctor Who for the age of Joss Whedon. ‘Where do we go from here?’ sang the cast of Buffy at the end of the last undisputed masterpiece of that series. Neverland leaves us with the same question. Like the makers of Buffy, the audios don’t have a convincing answer. But finally, it seems, the BBC might.